Nefertiti is a studio album by American jazz musician Miles Davis, released in March 1968. Recorded on June 7, June 22–23 and July 19, 1967, at Columbia's 30th Street Studio, the album was Davis' last fully acoustic album. Davis himself did not contribute any compositions, which were mostly written by Herbie Hancock and Wayne Shorter. The fourth album by Miles Davis's Second Great Quintet, Nefertiti, is best known for the unusual title track, on which the horn section repeats the melody numerous times without individual solos while the rhythm section improvises underneath, reversing the traditional role of a rhythm section. C. Michael Bailey of All About Jazz cited it as one of the quintet's six albums between 1965 and 1968 that introduced the post-bop subgenre. Shortly after this album, Hancock recorded a different version of "Riot" for his 1968 album Speak Like a Child. In 1978, Shorter recorded a new version of "Pinocchio" with Weather Report for the album Mr. Gone. Nefertiti was the final all-acoustic album of Davis' career. Starting with his next album, Miles in the Sky, Davis began to experiment with electric instruments, marking the dawn of his electric period. Sides one and two were combined as tracks 1–6 on CD reissues. ^ a b c d "Miles Davis – Nefertiti". milesdavis.com. Retrieved February 4, 2017. 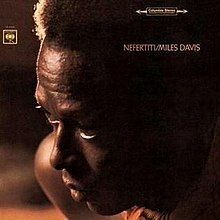 ^ a b "Miles Davis – Nefertiti (CD)". Discogs. Retrieved February 4, 2017. ^ a b c d "Nefertiti – All Music Review". All Music. Retrieved February 4, 2017. ^ Frank Alkyer Enright; Jason Koransky, eds. (2007). The Miles Davis Reader. Hal Leonard Corporation. pp. 305–6. ISBN 1617745707. ^ "Nefertiti – Acclaimed Music". acclaimedmusic.net. Retrieved February 4, 2017. ^ Considine, J. D.; et al. (November 2, 2004). Brackett, Nathan; Hoard, Christian (eds.). The New Rolling Stone Album Guide: Completely Revised and Updated 4th Edition. Simon & Schuster. p. 215. ISBN 0-7432-0169-8. ^ Swenson, J., ed. (1985). The Rolling Stone Jazz Record Guide. USA: Random House/Rolling Stone. p. 58. ISBN 0-394-72643-X. ^ Carter, Ron; et al. (2012). Miles Davis: The Complete Illustrated History. Voyageur Press. p. 126. ISBN 0760342628. Retrieved July 20, 2013. ^ "Rediscovering the Miles Davis Quintet". Slate. Retrieved February 4, 2017. ^ "Miles Davis – Nefertiti (LP)". Discogs. Retrieved February 4, 2017. ^ "Miles Davis – Nefertiti (CD)". Discogs. Retrieved February 4, 2017.